Lola was the high school beauty queen who had to marry young. Trapped in a lonely marriage, she and Doc, a recovering alcoholic on the brink of relapse, live in a cluttered Midwestern home heavily infused with disappointment and tension. When Marie, their pretty young boarder, takes up with Turk, an unrefined athlete, the relationship not only intrigues both Lola and Doc, but also disturbs the delicate domestic balance of the household, leading to an inevitable, but still surprising confrontation. The original production of Come Back, Little Sheba opened on Broadway at the Booth Theatre on February 15, 1950. 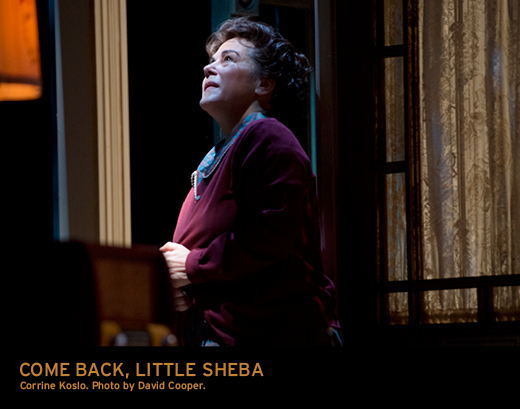 Come Back, Little Sheba was presented at the Shaw Festival in Niagara-on-the-Lake, Canada as part of their 2012 season. The production was directed by Jackie Maxwell and designed by Christina Poddubiuk, with lighting design by Bonnie Beecher and original music by Zachary Florence. Beatrice Campbell was the stage manager and Ivory Seol was the assistant stage manager. The production featured the following cast: Corrine Koslo (Lola), Ric Reid (Doc), Julia Course (Marie), Kevin McGarry (Turk), Sharry Flett (Mrs. Coffman), Andrew Bunker (Bruce), Lorne Kennedy (Postman), James Pendarves (Milkman), Graeme Somerville (Ed), Sanjay Talwar (Elmo) and Jonathan Tan (Messenger). Click here to read an interview with Zachary, along with composers Wayne Gwillim and John Gzowski, about composing music for non-musical plays. Unfortunately, the embedded audio clips don’t work, but you can listen to music samples below. Click here for a behind-the-scenes look at the design process for Come Back, Little Sheba, as told by director Jackie Maxwell and the designers. The music for Come Back, Little Sheba was recorded by Jeff Wolpert at Desert Fish Inc. in June 2012.